Digging out in the wild or on the beach is a fun activity. Digging in our garden or the yard is not desirable. Digging–its a thing. Hi Shela and Cliff- just a quick note to say, again, how much I love, love, love Willow! And not just because of her multitude of accomplishments- UKC Best-In-Show and High-In-Trial Champion Sunstar Willow of OwyheeStar, AKC Canine Good Citizen, AKC Novice Trick Dog, UKC Rally Obedience I, UKC Agility I, Therapy Dog International certified. She is such a wonderful dog in all respects- sweet temperamented, active yet calm, outgoing yet polite, she likes people and other animals, is highly intelligent and biddable, and has such a nice outlook on life in general. She is strong and healthy, and everywhere we go people marvel at how beautiful she is. I could not ask for a more perfect Weimaraner! I cannot believe she is almost seven years of age (a “veteran” in dog show circles), it seems like just yesterday I picked her up from you! ~Can We Comprehend the work she does? Probably not! Jan and Willow we know them. Willow’s official Name: UKC Best-In-Show and High-In-Trial Champion Sunstar Willow of OwyheeStar, AKC Canine Good Citizen, AKC Novice Trick Dog, UKC Rally Obedience I, UKC Agility I, Therapy Dog International certified! When Jan isn’t showing Willow, she can be found out and about the community where she works for Des Moines Police Department as an Animal Control Officer. In her spare time, she teaches obedience classes, visits her mother at a care facility, and volunteers. We are honored to know her and to call her a good friend. Our Weim business has factored into our relationship. We have joint-ventured on a couple of things. All of this might be of interest to you, but did you know she is a local town hero? I am sure she would blush at that description–forgive us Jan. The only bigger hero here is Rex, the German Shepherd. What a heartwarming story. Thank you, Jan, for your service. We are all blessed indeed to share the love of the Weimaraner with you. SEATTLE — Rex, the German Shepherd who was beaten and shot three times while defending his teen owner, was honored Tuesday at a ceremony in Seattle. Rex was reunited with Des Moines Police Department Animal Control Officer Jan Magnuson, who saved Rex’s life by rushing the critically injured dog to a veterinary clinic. (December 1, 2017) — Cypress had her sixteen-week titer and it came back fabulous so she won’t need another DAP right now. We did her rabies vaccine, so she is set for a while. I plan to do the two-vaccine Lepto in a bit, as we do have Lepto in this area, it is not a combo vaccine (I did that with Willow too). Cypress is very healthy, no signs of parasites and she is gaining weight. Her condition and coat are beautiful. She is very clumsy, she is like a foal or a fawn, she trips over her own feet and legs sometimes! She is around 35 pounds now at four months. I took her to obedience class this week, she is just learning her basics and I was able to use her for demos. I am happy now that Cypress’s immunity is in full swing, she can meet more (safe) dogs. She is kinda shy and reserved at first with people and new situations, she is more that way than Willow was, but she is coming around. With that type of temperament comes the very positive aspects where she stays close to me and doesn’t wander off, checks for my approval constantly, and is VERY bonded with me. She is VERY biddable. Cypress and Willow and Daisy adore each other, they all play and play, and they all have similar gentle play styles. I chuckle that at first Daisy was unimpressed with a new puppy in our family, but within a very short time, they became fast friends! Willow is the best big sister ever, she is so gentle and patient with Cypress, I am so happy. I always make sure to give each dog their separate, special time with me, while I leave the other two outside or whatever- I feel that is one of the reasons I have always had multiple dogs that get along. PS: I am always happy to be a reference as you know! We are beyond blessed. Thank you, for all your help over the years–support, encouragement, referrals, endorsements, and what you do with your OwyheeStar Weims. It means more than words on a page can express. We wish you continued success in your journey. We are ecstatic about the titles and the joy you find in all you do with the girls. Here are a few pics of Willow and me in the ring last weekend, Thanks to photographer Lexi Darienzo ! Many thanks to Jan Magnuson for all she does including the competitions. Anyone who has competed realizes the cost on every level. Anyone living within driving distance of Des Moines, WA would be well-served to use her Sunstar All Breed Training Services. Willow is amazing!!! 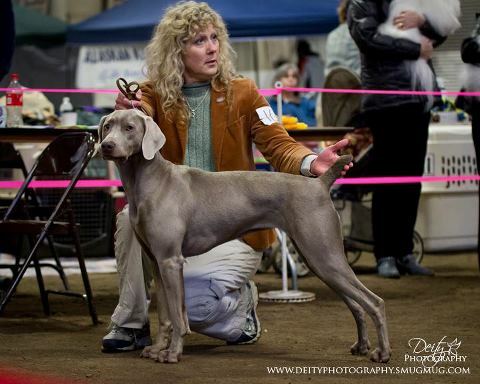 She won TWO Altered Best-In-Show awards yesterday (Saturday June 3rd) at the UKC shows in Chehalis, we are all so excited! Big Thanks to judges Judy and Jim Jones for the wins and the nice comments, to Julie Lechuga for putting on the wonderful shows, and to Hillary Tregillus for the fabulous pro photos! Willow is such a gorgeous, sound girl, and is so sweet- she enjoys visiting with everyone at ringside, getting petting and giving kisses to little kids! Congratulations to Jan and Willow. They continue to net ribbons and titles as well as to make friends wherever they journey. This is most certainly not the last of their adventure. They have competitions slated for this summer. We will be talking more about Jan, Willow, and her achievement as the weeks go on. This photo speaks to our heart. It says, “So, what did you expect?” At thirteen months she is amazing. We are so very proud of Jan and Willow. Willow is only one competition win (“major”) away from her UKC CH, so she will get that in time. She is a silly, wiggly puppy and I love that about her, she makes me laugh repeatedly on a daily basis! She will settle into herself, mentally and physically, within the next year, so I am confident she will get her UKC CH in 2013. I just started a breed ring handling class with her this week, it runs for two months, so she and I will both get good ring practice there; we have a Wheaton Terrier, a Shiba, an Akita, a Cavalier, and my friend Kathy the instructor has Belgian Shepherds, so it is a good mix. Willow stacks herself nicely, we just need more work on holding her stand-stay (I don’t want to be too firm with her as I want her to enjoy showing) and her gaiting, as she gets overly excited when we trot, she wants to “boing” through the air, LOL! She is such a character!
! My doctor told me last week that a doctor friend of hers lost her old Weimar recently and wants to get another but is not ready yet- I told her all about Willow and to contact me when she is ready so I can send her your way! Breeder’s Note: OwyheeStar thanks Jan for keeping us updated on Willow’s progress. A puppy grows so quickly that is hard to believe this was Willow last January. She was still at OwyheeStar. The photo to the left was her at three weeks. The second photo was taken at five weeks. Finally, we thank Jan, for her referrals. A lot of our placements are to repeat clients, and referrals. Our success has grown due to a lot of hard work, but also because of our fan base. Thank you, each and everyone!